The higher education landscape in Missouri is comprised of 25 private colleges, 13 public colleges, 14 two-year colleges and more than 150 for-profit and private career schools. Students from near and far elect to complete their degrees in Missouri, thanks in part to an expansive range of educational offerings. Currently, the state has nearly 450,000 postsecondary students enrolled, with more than half attending public two- or four-year institutions. It's clear Missouri has a significant draw when it comes to delivering college-level courses, but how do prospective students pick the best school for their needs? 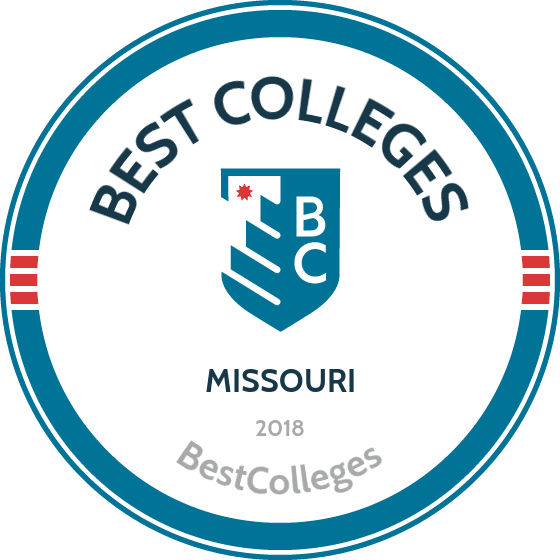 Using our sophisticated data analysis, we have applied our rigorous methodology to the latest education data to rank the best colleges in Missouri, including the top four-year and two-year schools. Whether seeking a small private liberal arts college or a large public research institution, the "Show Me State" offers a wide range of choices when it comes to schools granting baccalaureate degrees. Though four-year institutions are pricier than their two-year counterparts, the state is known for being generous when it comes to assistance. For the 2012-2013 academic year, public and private institutions awarding undergraduate degrees provided $3,378,839,680 in financial aid. While the average for student debt among graduating seniors sits at $33,000, Missouri graduates average far less. As of 2014, 63% of students left school with educational loans, averaging $24,957. Students at these institutions run the gamut when it comes to interests and aspirations; the current top five degree areas include business, education, health, social sciences and engineering. College of the Ozarks is dedicated to encouraging academic and Christian growth within students. Academic programs are Christ-focused and include culinary arts, theatre, and agriculture. There are pre-professional programs for students looking to attend graduate, medical, or law school. The university has been ranked as a best college, yearly, since 1989 by the U.S. News & World Report. Ozarks accepts all letter grades from transfer students, however, students coming in with a 2.0 GPA or lower will start under academic probation. College of the Ozarks is located in Point Lookout, Missouri on 1,000 acres near the towns of Branson and Hollister. Its unique, tuition-free structure allows students to work on campus as part of the Work Education Program. Once students complete the program, C of O guarantees the entire educational costs to the students, allowing them to graduate debt-free. This is how the college earned the nickname "Hard Work U" and why it's ranked one of the best colleges in Missouri. Kirksville, in Northern Missouri, is home to Truman State, which is Missouri's only highly selective public liberal arts and sciences university. It's consistently ranked among the best colleges in the nation due to its quality of education and affordable prices. Truman maintains the highest graduation rate among Missouri colleges and universities according to the state's department of higher education. Truman State offers several unique academic majors and minors, including latin, romance language, equine studies, data science, celtic studies, and others. The university's small environment allows for small class sizes, with a low student-to-teacher ratio of 16:1. More than 200 student organizations make the small Truman State community a vibrant one. There are 20 varsity athletic teams participating in the NCAA Division II Great Lakes Valley Conference, and 98% of freshmen live on campus. Truman has the highest percentage of students with Bright Flight scholarships. Washington University offers many major and minor programs to its over 15,000 students. Immunology, negotiation and dispute resolution, and robotics are just a few areas of study available at Washington University. Students get to study in the vibrant city of St. Louis, with two campuses adding up to 2,300 acres. The campus buildings are modern--21 are LEED-certified by the U.S. Green Building Council. The campus art museum and theatre host unique performances and collections for students and the community. Among colleges in Missouri, Washington University stands out because of its research opportunities, with 24 Nobel laureates associated with the university. Each college has extensive research facilities, but the School of Medicine is the largest research enterprise on campus. It is world-renowned for clinical, translational, and basic research; backed by grants, research funding, and the Howard Hughes Medical Institute. Logan resides on a 112-acre campus in Chesterfield, just west of St. Louis. It is one of the most unique Missouri colleges because of its Purser Center, where fundraisers, auctions, seminars, recitals, concerts, and many other community and campus events take place. Students enjoy the on-campus wellness center with indoor training and outdoor athletic courts. Logan participates in the Chiro games, an athletic competition with other Chiropractic colleges nationwide. Logan's unique Doctor of chiropractic degree gives students hands-on experience in the first-semester. A Doctorate of health professions education is also available, along with master's and bachelor's degrees. Most programs at Logan focus on different topics within health and biology. Clubs correlate with student classwork, and includes Public Health, Posture Crew, Animal Chiropractic, and other organizations. Career development resources include ongoing visits to clinics and classified ads for career opportunities. Missouri University is located in Rolla, between St. Louis and Springfield. Students participate in more than 200 student organizations, such as the BBQ Club, Humans Versus Zombies, Military Aerospace Society, Christian Fellowship, KMNR radio station, and many others. Fraternities and sororities engage students in meaningful friendships. Volunteerism is a high priority at Missouri S&T, with 710 volunteer hours just on Martin Luther King Jr. Day. Ongoing opportunities coordinated by Missouri S&T make it easy for students to give back. Missouri S&T offers 97 degree programs to their 8,800 enrolled students. 18 design teams take learning outside of the classroom as they create solar cars, houses, and human-powered vehicles. The average lab size is 17 students, allowing each to explore the sciences without being overcrowded by classmates. New technology -- ranging from clickers to virtual classrooms to online learning -- makes Missouri S&T a unique place to learn and one of the best colleges in Missouri. Missouri-Columbia, founded in 1839, is also known as Mizzou. It's the largest university in the state, with 300 degree programs and more than 33,000 students. On average, student's graduate in 4.2 years. Mizzou has 20, NCAA Division One sports programs that are part of the Southeastern Conference. Mizzou is one of only six public universities nationwide that has a medical school, veterinary medicine college, and law school for students pursuing graduate school. Undergraduate programs range from parks, recreation and tourism to forestry. Mizzou is known for its beautiful campus, which is designated as a botanic garden and has more than 42,000 plants and trees. Mizzou offers 89 online options for distance learners. Master's and Doctorate programs are available. Notable alumni includes actors Jon Hamm, Chris Cooper, and Tom Berenger; Senator Tim Kaine; and professional athletes Max Scherzer, Carl Edwards, and Kellen Winslow. Missouri State is located in Springfield, the third largest city in the state. The city offers one of the largest indoor shopping malls in the state, with more than 190 stores. MSU-Springfield is a great option for students looking for colleges in Missouri with entertainment. The university frequently invites Broadway plays and entertainers to hold performances on campus; the JQH Arena is home to basketball games, concerts, and speakers. Students enjoy the Ozarks and the great outdoors at the local Ozarks Greenways and the Springfield Conservation Nature Center. MSU-Springfield is growing, with enrollment increasing 16% in the last 10 years. 85% of students are undergraduates, and the most popular college is Business. Other academic programs include animal science, audio studies, community and regional planning, and others. Alumni participate in MarooNation, an active alumni association with events, volunteer opportunities, and travel abroad options. Webster is one of the Missouri colleges located in Saint Louis. It's a diverse university; students come from over 100 countries to attend Webster. Curriculum is focused on a global perspective and campuses are located globally, including Thailand, Ghana, Switzerland, and Austria. There are 60 campuses total, making it one of the most global universities in the world. Webster students can choose from 355 degree programs, with 309 available at the St. Louis campus. On-campus activities include the Global Student Leadership Summit, which is held at various Webster campuses throughout the world. 30 student leaders from around the world-wide Webster community come together for leadership development, networking, and excursions in the city. Other on campus events include campus ministry, a student radio station, a student newspaper, film series, and 14 athletic teams. Alumni of Webster includes actor Rob Riggle, former U.S. Representative John Boccieri, and actor Jenifer Lewis. At SLU, students can learn from the world-class campus in St. Louis or the SLU Madrid campus abroad. Undergraduate programs like aerospace engineering, nuclear medicine technology, and nutrition and dietetics teach scientific principles. The 90 different undergraduate programs, combined with concentrations and minors, offer options for students to customize their learning experience. The university's castle-like campus was founded in 1818, making it one of the nation's oldest universities, and one of the best colleges in Missouri. Its 13,000 students use SLU's highly ranked research programs, contribute more than 1.6 million service hours annually, and participate in more than 150 student activities offered through the Student Involvement Center. The Cross Cultural Center encourages multicultural involvement by planning events like Diversity Awareness Month and Multicultural Education Workshops. SLU alumni live in all 50 states and 146 countries. Famous alumni includes Enrique Bolanos, president of Nicaragua from 2002-2007; and novelist Richard Dooling. UMSL is located in St. Louis and has 17,000 students. Students participate in athletics, intramural sports, workshops, and events, ranging from dances to chair yoga. It is the largest public research university in Eastern Missouri. Graduates are found in all 50 states and in 63 countries, and UMSL graduated a record number of students in 2016, who have an average starting salary of $44,000. UMSL stands out among colleges in Missouri because of its university library system, which has an ask a librarian chat, eBook assistance, advanced journals, and repositories available for students learning from home. A variety of undergraduate and graduate programs are available online and on-campus. For transfer students, pre-advisements and pre-evaluations are offered to help students know how their courses would transfer and see which courses they should register for upon acceptance. Alumni of UMSL includes retired St. Louis Police Chief Daniel Isom and rapper Prince Ea. UMKC began teaching classes in 1933 to 265 students. It's current total enrollment is over 16,000 students. The school offers over 50 majors in over 125 academic areas. The student body represents 50 U.S. states and more than 80 countries. Bachelor's programs at UMKC include education, urban planning and design, and mathematics and statistics; three MD's are offered in biology, chemistry, and liberal arts. Online programs are offered through Blackboard. The school's LGBTQIA programs offers more personalized support, resources, and education. Many student organizations are available to join, including video game competitions, swim meets, and movie clubs. Learners can volunteer at the Kangaroo Pantry, a food-bank for the school's community. Fraternities and sororities are available for students to join. UMKC has many men's and women's sports, including cross country, basketball, and tennis. Student resources include academic support and mentoring, a writing studio, and tutoring. Lindenwood, located in St. Charles, Missouri, is home to the Lions, who recently had an athlete awarded Defensive Player of the Year among NCAA Division II, III, and NAIA programs. 32% of students participate in intercollegiate athletics. Programs at the university include game design, digital content, and early childhood education. Lindenwood was established in 1827 as the oldest college west of the Mississippi River; it sits on 500 acres. Its library has a massive 92,000 volumes of text, in addition to MOBIUS access, allowing students to research using 75 academic and public libraries across the state. On-campus, evening, and online courses are available, with unique degrees like fashion design and nonprofit administration. Its Student Research Conference allows students to display their scholarly findings on campus. Lindenwood offers minor programs and accelerated degrees. Notable alumni includes director Lee Daniels, painter Alice Barber, and MLB Network studio host Greg Amsinger. Located in Nevada, Missouri, Cottey College is a women’s institution founded in 1884. Cottey offers associate and bachelor’s degree programs in areas such as criminology; health sciences; fine arts; English; and women, gender, and sexuality studies. Cottey's programs emphasize hands-on learning, and the college supports students pursuing volunteer, internship, and study abroad opportunities. Freshman applicants must have a minimum 2.6 high school GPA and at least a 21 ACT score or a 970 SAT score. Transfer applicants must have earned at least 12 previous credits with a minimum 2.0 GPA from a regionally accredited institution. Cottey is one of the most affordable colleges in Missouri and offers a flat, annual tuition rate. William Jewell graduates have a 98.9% job or graduate school placement within six months of graduation. Its emphasis on writing skills, research, and leadership makes it one of the best colleges in Missouri. By adding three experiential components to the core curriculum, students can easily add a second major onto their degree; more than 40 degrees are available. Journey grants at a minimum of $2,000 are available for student study abroad experiences, enabling them to learn in different cultures around the nation or world. The college is in the large Kansas City suburb of Liberty, Missouri and has approximately 1,000 full time students, allowing for a small 10:1 student-to-faculty ratio and an intimate environment. 65% of classes contain 20 or less students. Athletics, student organizations, spiritual clubs, and extensive service projects make it easy for students to get involved on campus. 99% of students receive scholarships. Maryville University is recognized by Apple as a distinguished school for innovation and leadership. Undergraduates receive free iPads and access to 80 learning apps for an interactive, collaborative, and creative learning environment. The student-to-faculty ratio is 13:1, and more than 90% of faculty have a PhD. This emphasis on student success makes Maryville one of the top Missouri colleges since graduates have a 94% job placement. Marysville emphasizes technology and has a vibrant and diverse student population, with students from 55 countries and 50 states. The school has over 90 student clubs which translates to more than 2,500 events a year, including weekly service projects, religious awareness meetings, movie nights, and Maryville's Got Talent. The campus is only 20 minutes from downtown St. Louis and offers 130 acres of rolling hills, lakes, and walking trails. Marysville offers 19 master's and five doctoral programs. Rockhurst, located in Kansas City, offers a unique learning environment for students wanting to incorporate Jesuit core values into their education. It emphasizes ethical values and service, with a dedicated mission and ministry office that offers a variety of programming to make the mission come alive for students, faculty, and staff. Other campus events include greek life organizations, leadership classes, honors societies, and political and multicultural clubs. Rockhurst offers more than 50 undergraduate and graduate programs in a variety of fields. The university has 3,000 students enrolled each year, and 95% of graduates are employed or receive graduate school acceptance within six-months of graduation. The university partners with 500 employers to help students find job opportunities. Job listings, campus interviewing, and career advising make Rockhurst one of the colleges in Missouri to consider for students focused on career goals. Famous alumni includes former mayor of Kansas City, Kansas, Joe Reardon, Cheers actor George Wendt, and current Kansas City, Missouri, mayor Sylvester James. Northwest Missouri makes education affordable by providing every full-time student with a laptop to use during the school year, and renting textbooks for only $6 per credit hour. The school offers 127 undergraduate and 40 graduate programs, with business, education, geography, and the agriculture department graduating the most students. Unique majors include marine biology and reading. 73 minors are available to complement undergraduate degrees. Online bachelor's and master's degrees are available, including two certificates. Northwest is located in Maryville, near the Iowa and Nebraska borders. Its university is one of the best colleges in Missouri for agriculture, with a university farm that offers students hands-on experience. Campus life traditions include Family Day, Walkout Day, the Kissing Bridge, and the mascot of bearcat. Students can stay physically fit at the 19,000 square foot fitness center or the outdoor education recreation area. Southeast Missouri was established in 1873 in Cape Girardeau, Missouri. The campus offers an interactive, virtual tour with 360-degree photographs showcasing the beautiful interior and exterior of campus buildings. Its campus stands out from other Missouri colleges for its aquatic center, rec center, and unique Academic Hall, which is more than 100 years old and the icon of the campus. Regional campuses are accessible in Kennett, Malden, and Sikeston. One of the unique academic programs at Southeast Missouri is cybersecurity. This program takes a security perspective to the traditional computer science topics to fill the growing industry and need for cybersecurity professionals. Other areas of study include agribusiness, middle school education topics, and unmanned aircraft systems. The First Year Success Program helps new students by providing them with access to the Center for Writing Excellence, honors programs, and other resources. Semester and full-year study abroad programs are available in more than 35 countries. Warrensburg has a population of 19,000 and is home to Central Missouri. The school offers over 150 academic programs and multiple scholarships, with 90% of students receiving financial aid. The 15-to-Finish scholarship stands out among Missouri colleges because it incentivizes continuous, full-time enrollment. Students who stick to the four-year plan and finish on time will receive a scholarship during their last semester. Summer sessions are available for learners trying to complete their degree quickly. Study abroad opportunities are available in over 60 countries. Central Missouri students can sign up for a personal trainer through the Student Recreation and Wellness Center. FitFest is a semester-long fitness challenge with prizes for students who complete it. Other events and organizations include Central Trek outdoor adventure, coordinated volunteer opportunities, 58 intramural sports, student organizations, and the IMPACT leadership retreat. Students enjoy the on-campus bowling alley and live-in residence halls just minutes from campus. Hannibal-LaGrange is one of the Christian colleges in Missouri. It is affiliated with the Missouri Baptist Convention, which is Southern Baptist, but all denominations are welcome on campus. Its location in Hannibal, Missouri, is only 100 miles north of St. Louis, on 110 acres of hills and bluffs. Students participate in 35 clubs and organizations and 16 athletic teams. HLGU enrollment is 1,150, allowing for more one-on-one time with classmates and professors. It's one of the most reasonably priced universities in the midwest, and 93% of students receive financial aid. Thirty-four majors are offered, with a strong education program certifying teachers through online and on campus programs. The university's honors program awards a scholarship to qualified students. It challenges them by providing a platform where they can discover their own opinions from a Christian perspective. Famous alumni includes past NBA coach Lowell "Cotton" Fitzsimmons. Evangel, the first Pentecostal liberal arts college in America, was founded in 1955. The college was built upon an old Army hospital. The school offers over 100 academic programs; undergraduate programs include early childhood education, criminal justice, applied mathematics, and Biblical studies. An array of concentrations and minors are available to complement the undergraduate programs. Evangel offers adult studies programs. The school's master's, doctorate, and PhD programs consist mostly of theological studies. Evangel has an on-campus chapel which hosts three services every week. This includes regular chapel services and special focuses like Missions Week, Spiritual Emphasis Week, and department specific chapels. Off-campus trips are offered every year, where students can serve the Lord in a foreign country, upcoming trips include El Salvador, Russia, and England. Evangel offers men's and women's varsity sports, including basketball, cross country, and soccer. Missouri Baptist is a private liberal arts university located in St. Louis, with regional learning centers throughout the city and in bordering counties. Online courses are flexible and affordable. Daytime classes take 16 weeks to complete, while evening courses are taken in an eight-week format. What makes Missouri Baptist unique among Missouri colleges is its affordability. Tuition and fees are below the national average for private, four-year universities, and 50% of students pay only half of the tuition cost due to scholarships and financial aid. 71 programs are offered at the undergraduate, graduate, and doctoral levels. Domestic and foreign ministries and missions help build student faith. Mission trips to places like Guatemala and Italy provide opportunities for missionary service and personal growth. Student activities include intramurals, homecoming, Spring Fling, Seniors Brunch, and others. The MBU Leadership Institute helps students of all backgrounds develop stronger leadership skills. William Woods, founded in 1870, has over 1,100 traditional undergraduates that represent 35 U.S. states and 24 countries. The school sits on a 225-acre plot in Fulton, Missouri. Thirty-six bachelor's programs are available, and 24 minors programs enhance the degree. Areas of study include american sign language, business, education, and equestrian. The school offers a unique MBA in 5 program. It provides students with about 40% savings over the cost of a regular MBA by combining undergraduate and master's studies into one course plan. This enables students to earn an MBA in five-years or less. Any student can take the program as long as they minor in business administration. Learners can participate in men's and women's sports, including baseball, track and field, and basketball. William Woods has internships available in most academic areas. The school's own Mentor-Mentee Program has students research and create projects with a faculty members; They are usually part of a broader, ongoing effort. Westminster, located in Fulton, Missouri, is home to unique Greek revival architecture and a low student-to-faculty ratio of 14:1. It's one of the most diverse liberal arts colleges in the nation, with 76 countries and 28 states represented. The Hancock Symposium takes place each fall, allowing students to hear from unique speakers and participate in breakout sessions specific to their interests. The admissions process is selective, with recent incoming classes having an average GPA of 3.5. Westminster has a Four-Year Promise Program that is unique among colleges in Missouri. If you don't finish your degree in four-years after following academic catalog guidelines, Westminster will pay your tuition. Academic advising and 3-week online courses during winter break help students accomplish this goal. Students are molded into strong leaders through the Price Leadership Program, which incorporates technology, individual mentorship, and planning. Located in St. Louis, Missouri, Harris-Stowe State University is a historically black institution that offers programs emphasizing innovation and ethical leadership. HSSU offers 31 certificate and degree programs in fields such as healthcare management, business administration, secondary education, and sustainability and urban ecology. The university's summer bridge program helps new students transition into college life. HSSU maintains partnerships with institutions such as the Kansas City University School of Medicine and Biosciences to provide graduates with a smooth pathway into medical school. Unlike other colleges in Missouri, HSSU has no minimum GPA or standardized test score requirements. However, the average applicant holds a 2.8 GPA and ACT or SAT scores of 17 or 850, respectively. Transfer applicants with at least 30 previous credits do not need to submit test scores. More than 140,000 students in Missouri currently attend the state's 55 public and private two-year institutions. The top five associate degrees handed out in the state are in areas of arts and humanities, health, education, business and public services. With the rapidly rising cost of higher education, gaining an associate degree before transitioning into a four-year program can be an excellent money saving measure. Community College Review reports the average cost for public community college is $7,890 per year for in-state students, while a public four-year institution costs an average of $15,022 for the 2012-2013 academic year. Though the majority of students attending two-year institutions in Missouri are in-state, these institutions also attract those from farther away. With the state's cost of living set at 91.1% of the national average, this adds up to even further savings. St. Charles Community College (SCCC) is one of the best community colleges in Missouri, with graduates who have gone on to work for hundreds of reputable companies like AT&T, Boeing, and Edward Jones, as well as many more local organizations and governmental institutions. SCCC offers Associate of Applied Science (AAS), Associate of Science (AS), and Associate of Arts (AA) degrees across a wide range of domains, including art; business; education; healthcare; trades/manufacturing; and several others. Transfer pathways are also available in most academic fields. Innovative degree options like business technology, health information management, and multimedia and web design offer a broad range of career and transfer options for 21st century learners. Students have many opportunities to get involved, including through the theater program, dozens of clubs and organizations such as Ultimate Frisbee and Student Government, and intercollegiate and intramural sports. About 87% of SCCC students continue to work part- or full-time while attending their program. As one of the top-ranked adult-oriented Missouri community colleges, Cape Girardeau Career and Technology Center (Cape CTC) is committed to offering hands-on learning experiences that promote development of 21st century skills and foster continuous learning. Students can choose from high-demand programs in health care, including medical coding & terminology, as well as in technical fields like the culinary arts, landscape horticulture, electrical trades, and many more. Students completing Cape Girardeau's programs earn professional certificates and can continue pursuing related associate degrees through nearby Mineral Area College. Most programs can be completed over four semesters. Job portfolio services and information on openings are available through Cape CTC's Career Placement Services. In addition to accepting most forms of federal and state-based financial aid, Cape CTC offers several private scholarships and veterans benefits. Cape CTC also offers high school students early enrollment in many programs, from digital media to health occupations. About 95% of State Technical College's (State Tech) graduates find employment after graduating, with 87% finding a career directly related to their degree. One of the most popular Missouri community colleges, State Tech offers 35 associate degree programs, with unique options like aviation maintenance, nuclear technology, and commercial turf & grounds management. Private merit- and academic-based, as well as program-specific scholarships, are available to qualifying students. State Tech's library is located in its updated Information Technology Center, with a reading and study space that overlooks the campus' 2-story glass atrium. The college features an annual career expo on its campus, as well as other annual events like Dyno Day and Car Cruise In, which is also open to the public. Students also have access to State Tech's exclusive careers portal and Career Services staff, who maintain many industry partnerships throughout Missouri. Students looking for opportunities to participate college life can join a range of clubs and organizations, including but not limited to the honor's society Phi Theta Kappa or the STC Air Rifle Club. Hillyard Technical Center has served as a leader in local workforce training since World War II, when it was founded through the generous efforts of Newton Scott Hillyard, and is one of the best community colleges in Missouri for adult-oriented training. Programs may result in either a professional certification or an associate degree, and students are prepared to take any state or professional licensure exams required for certification. Adult students looking to advance their career or enter a new field can choose from skilled technical and health science programs like fire science, electronics technology, diagnostic medical sonography, and more. Hillyard also opens its doors to high school students who would like to accelerate their career options through one of its two-year program, beginning in a student's junior year of college. HTC organizations include SkillsUSA, a national organization serving students preparing for careers in technical and service fields, as well as the National Technical Honor Society. Jefferson College offers four types of associate degree programs, including transferable AA, AS, and AAT degrees, along with a list of AAS options for students interested in pursuing immediate employment. Versatile career paths include but are not limited to degrees in law enforcement/criminal justice, automotive technology, and business management. Jefferson College is the only one of our top-ranked community colleges in Missouri to have held a TEDx Conference, and the college offers plenty of monthly activities. From themed "Creation Station" food gatherings, where students create their own trail mix or decorate cupcakes, to basketball games and volunteer blood drives, Jefferson offers something for everyone. The Student Leadership Program provides outstanding students with opportunities to develop their leadership skills through special training programs. Jefferson College is also a participant in the A+ Schools Program, which provides free tuition to students who have attended an A+-designated high school and met all eligibility requirements, which include a 95% attendance record and a GPA of 2.5 or better. MACC administers a program that prepares graduates for entry-level roles and for further studies at four-year institutions. The school, located in Moberly, Missouri, offers associate degrees in business, general studies, health science, behavioral science, and STEM. MACC also offers an associate degree in nursing along with certificate options in occupational therapy, medical lab technician, and phlebotomy training. MACC is one of the top community colleges in Missouri, preparing students for careers in a variety of technical trades. Associate degrees in engineering design and development, mechatronics, and advanced manufacturing technology are ideal for students who want to become electrical and mechanical technicians. There is also an associate of arts in teaching that is state-approved and easily transferable to four-year colleges. Students at MACC benefit from comprehensive support services including tutoring and career placement. Saint Louis Community College's available associate programs include transfer degrees, as well as career and technical degrees. Saint Louis is the only one of our top-ranking, two-year colleges in Missouri to offers accelerated degree options structured in the "7-one-7" format, which separates a traditional semester into two 7-week terms with a 1-week break in-between. Programs are offered at one or more of St. Louis' campus locations in Florissant Valley, Forest Park, Meramec, or Wildwood. Degree programs are wide-ranging and include options like dietetic technology, computer integrated manufacturing, and hospitality and tourism, to name a select few. All AA transfer programs require 64 credits to graduate. STLCC's Honors Program provides more challenging courses and qualifies students for exclusive scholarship opportunities. As a pioneer for community change, Saint Louis recently implemented the African-American Male Initiative, a program that recognizes the need for support and retention of African-American males in college programs. This new program offers a variety of services such as peer and community mentoring, tutoring services, special workshops and seminars, and more. Since its founding in 1965, Mineral Area College has upgraded and expanded its campus with a Fine Arts Theater, revamped learning resources center, an expanded library, and updated labs and classrooms in the Careers Wing, which houses the school's career and technical programs. Mineral Area is also one of several tobacco-free two-year colleges in Missouri. Mineral Area's transfer-friendly AA degrees, as well as career-oriented AS and AAS degrees, are available in a wide range of domains. AA program options include education and pre-professional degrees like pre-law, pre-architecture, pre-forestry, and several more. All AA programs require students to take credits in cultural diversity courses, which include languages, history, and literature. Several of Mineral Area's AS and AAS degrees, including construction/building technology, skilled trades, and physical therapy assistance are offered in collaboration with other career area or technical centers, as well as with the United States Department of Labor. Students at North Central Missouri College (NCMC) who want to later transfer into a four-year university can choose an AA or AAT degree, students on the fast-track for entering a career can choose one of several AAS programs. Though not designed as transfer programs, many of the AAS degrees are transferable through participating colleges and universities. Program options include, but are not limited to, early childhood development, agriculture & natural resources, and pharmacy tech. NCMC offers plenty of activities for students on its main campus, and the nearby town of Trenton, Missouri also provides cultural and recreational outlets like the Black Silo Winery and the Missouri Day Festival. NCMC also offers an Upward Bound program for first-generation college students, who are provided with free tutoring and mentoring, cultural activities, scholarship opportunities, and much more. As one of the best community colleges in Missouri, all of NCMC's programs are accredited by the Higher Learning Commission. Crowder College offers AA and AS degrees designed for students who want to transfer into a four-year program, as well as Associate of Teaching (AAT) and AAS degrees for students who want to gain the skills needed to immediately enter the workforce. In addition to fields like business and healthcare, students can choose an innovative AAS degree in agriculture or alternative energy. Transfer degrees range from biology to journalism to theater. As one of the best-connected community colleges in Missouri, Crowder's university partners--which include include Central Methodist, Missouri Southern State, and Missouri State--all maintain advising centers on the Crowder campus. High-achieving high-school students looking for a head start can also apply for Crowders' Dual Enrollment and Dual Credit programs. Crowder enrolls over 5,500 students at its main campus in Neosho as well as at its satellite centers in Cassville, Nevada, and Webb City. All programs are accredited by the Higher Learning Commission. Crowder is also home to the Longwell Museum, a public institution featuring local art exhibits and providing education on historical Ozark culture. Ozarks Technical Community College provides a wide range of general education and transfer associate degrees, as well as AS and AAS degrees in technical- and healthcare-related fields. As one of the top-ranking community colleges in Missouri, Ozarks also offers a unique associate of interdepartmental studies (AIS), which allows students to create a program of study that aligns with specific career objectives. A comprehensive set of student services includes counseling services; a "Breaking Traditions" program that supports non-traditional students pursuing STEM degrees; a Speech Communication Center that provides community support in world languages and public speaking; and much more. Over 25 years, Ozarks has graduated over 20,000 students from its main campus in Springfield. Most students are enrolled part-time, with the average student being 23 years old. Students can stay connected with OTCC on- and off-campus through its active social media pages, including Facebook and Twitter. MCC provides learners with an extensive catalog of two-year degree options at various sites in Missouri, including Kansas City. Most students who pursue associate degrees at MCC plan to transfer to a four-year college, though some enter the workforce immediately after graduation. MCC offers an AAS in business with tracks in accounting, management, and logistics management. The school's catalog of associate in applied science degrees covers technical fields such as automotive technology, mortuary science, physical therapy, electric technology, and industrial technology. One of the top schools in Missouri for apprenticeships, MCC administers an AAS in industrial technology with a comprehensive range of degree plans. They each require the completion of MCC coursework and an apprenticeship program approved by the federal government. Apprenticeship options are available in categories such as bricklaying, carpentry, industrial mechanic, plumbing, sheet metal, and industrial welder. East Central College is Franklin County's only community college, serving over 6,000 students each year. Available academic programs are some of the most diverse amongst all Missouri community colleges and span a diverse set of domains, including business & technology; education; fine & performing arts, industry & manufacturing; STEM; social & behavioral sciences; health sciences; and the liberal arts. Options range from art to chemistry, while technical or skilled programs offer students degrees in EMT/paramedics, precision machining, and many more. On-campus resources include a Student Learning Center, which is equipped with computer labs and free tutoring services; job fairs and internship referrals through Career Services; and a full-service library. East Central offers a number of program-specific scholarships, as well as scholarships and grants for military veterans and their families. State Fair Community College (SFCC) offers associate degrees that prepare students for direct entry into the workforce or sets them up for transfer into a bachelor's degree at a participating four-year institution. AAS programs range from 61 to 95 credits for degree completion, while associate degrees in the arts and sciences require 64 to 67 credits before transfer. With a main campus in Sedalia, Missouri, State Fair has six additional campus locations in the state. A low student-to-faculty ratio of 17:1 offers increased opportunities to connect with faculty and peers. SFCC is one of few community colleges in Missouri to offer a residence hall for on-campus living. Other facilities include a café that honors diet restrictions, as well as a 57,000-square-foot multipurpose center with full-sized basketball courts, an indoor jogging track, seminar rooms and much more. In addition to offering ongoing events like movie nights, trivia contests, and bowling trips, students can get involved through intramural sports, student government, a diverse array of clubs and organizations, or choose to become a Student Ambassador. Texas County Technical College (TCTC) is unique in the line-up of best two-year colleges in Missouri, exclusively offering an accelerated LPN to RN program that results in an AS degree in Nursing and prepares students to take the professional licensure examination. A new group of students joins each semester, with applications accepted throughout the year. The LPN to RN program includes a new student orientation, and students also have access to library services and academic counseling. In addition to accepting all federal financial aid resources, Texas County also offers select scholarships to students from high schools in the Houston area, as well as nursing scholarships to one undergraduate-level and one graduate student. TCTC is accredited by the Accrediting Council for Independent Colleges and Schools. If you're thinking about applying to one of the best colleges in Missouri, continuing reading to learn more about living in the Show Me State. The state is home to a number of large cities with plenty of activities to keep even the most adventurous student content. Conversely, the region is also known for beautiful rural areas. Regardless of a student's expectations for surroundings, Missouri likely has a city or town to meet those needs.